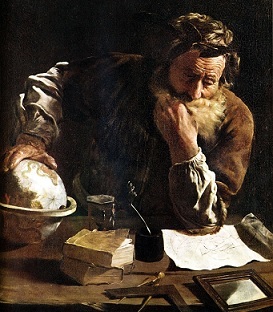 Archimedes (ca. 287-212 B.C.) - Greek scientist and mathematician who had the greatest technical mind of the ancient world. He utilized the lever for work and invented the screw pump which bears his name. One day while bathing, he figured out how to measure volume and ran through the streets of Syracuse naked, shouting "Eureka!" ("I have found it!"). Some say he made even more spectacular achievements such as building a giant mirror system which used the sun to burn up an entire fleet of Roman ships. A Roman soldier struck him down after he refused to leave a math problem.